Choosing the right member-management software is a big decision, and the selection process can be both tedious and time-consuming. That's why Wild Apricot has put together a free Membership Software Selection Guide, to help nonprofit and association leaders choose the best membership website software to match their goals, budgets, and technical know-how. The free downloadable ebook lays out a series of seven easy-to-follow steps for a smooth software review process. It suggests the most common pitfalls to look out for in creating a list of requirements, key questions to ask yourself and the software vendors, and the six most important considerations to look at beyond the functionality of membership website software. A feature comparison matrix is provided to serve as a starting point for assessing the features of different systems against your organization's needs. And because it can be so tricky to compare the costs of different website builders and membership management tools, as every company seems to structure their pricing differently, Wild Apricot's Membership Software Selection Guide also includes a spreadsheet calculator to help you estimate the total cost of ownership. "Obviously we would love people to go to www.wildapricot.com for a free trial of our affordable, easy-to-use software," says Dmitry Buterin, Chief Apricot, "but our priority is for association leaders to conduct an educated review of the best software for their goals, budgets and know-how to produce a quality membership website." 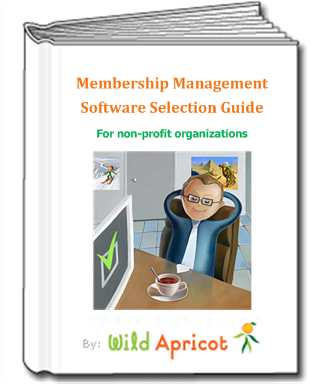 Wild Apricot has released its Membership Software Selection Guide under a Creative Commons license that allows free sharing to benefit the nonprofit and association industry. You can find it at https://www.wildapricot.com/guide.